With Adam Frenier, Patty Healey (center) is a member of the Massachusetts Nurses Association, and Angela Belmont (at right) is Chief Nursing Officer at Cooley Dickinson Hospital in Northampton, Mass. Joining us for a short debate on Question 1: Patty Healey, a registered nurse and member of the Massachusetts Nurses Association, which supports the ballot question, and in opposition, Angela Belmont, chief nursing officer with Cooley-Dickinson Hospital in Northampton. Adam Frenier, NEPR: We flipped a coin to see who will go first. Patty won the coin toss -- so I'll give you the first question. 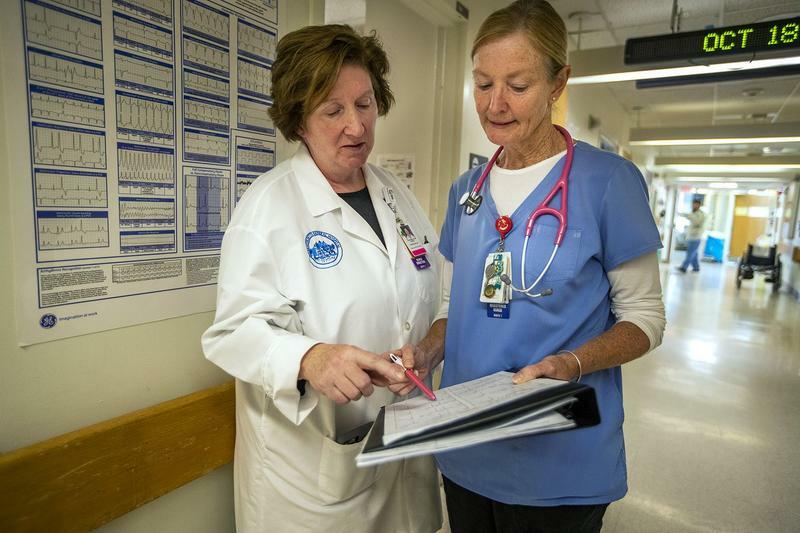 Tell us why are more strict nurse-to-patient ratios necessary in Massachusetts? Patty Healey, Massachusetts Nurses Association: Well Adam, across the country, hospitals have understaffed their nursing units, and that includes Massachusetts. And for many, many years, the nurses in Massachusetts have been trying to change this to make it safer, to make the workload better, so that we can deliver the high standard of care in every hospital in Massachusetts. And so we have done this ballot initiative -- after many attempts with the legislature, and through our union contracts -- to get a limit on how many patients nurses take care of. And that's why we're here today. We think this is the best way, after all these years -- to actually go to the public, and have the public understand how unsafe the hospitals can be without safe staffing. And Angela, why is Question 1 not necessary? Angela Belmont, Cooley-Dickinson Hospital: I don't believe Question 1 is necessary because, first of all, there aren't enough nurses in Massachusetts to even fill this ratio. Currently, we have a deficit of 1,200 RNs in Massachusetts. And if this ballot passes, it would mean that we would need about 5,000 nurses. I don't know where they would come from, and I don't know what the outcome would be in relationship to the quality of care, because it did not improve quality of care in California, and I don't believe it will either in Massachusetts. 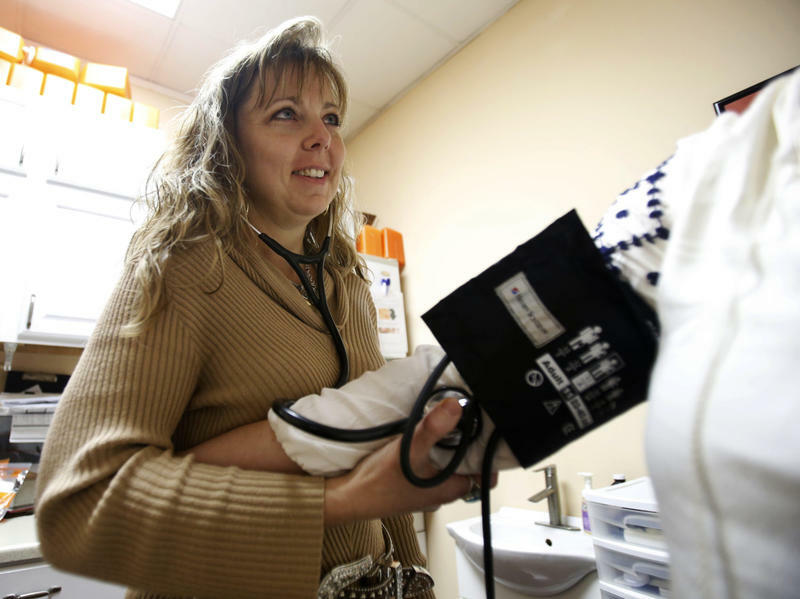 California is the only other state to mandate nurse-to-patient ratios by law. Angela, I'll let you go first this time. What can Massachusetts learn from that example? Angela Belmont: Well, in California, their ratios have not shown, as I said, any improvement in the quality of care for patients. And quite frankly, if you look at the nursing-sensitive quality indicators, Massachusetts scores higher than California currently, without the ratios, even though California has them in place. Patty Healy: Well, I think the Mass. Hospital Association and the hospitals have been grossly deceitful in giving out this kind of information. There are eight peer-reviewed studies over the past eight years in California that show that outcomes have improved. Cost has gone down, and the emergency room wait times have decreased. There have been clear changes there. There are studies. I actually gave the copies of the studies, the abstracts, to a Cooley-Dickinson administrator last night. So number one, it's absolutely not true that it hasn't worked in California. It has. And the medical studies are there to prove it. But there've also been nationwide studies on the nurse staffing, and how it affects patient care, and they have come out conclusively showing that patient care will improve. There have been a wide range of cost estimates on the price tag to implement Question 1 if it's passed. A study from a Boston College professor puts the cost at about $35 to $46 million. The hospital industry cites another study that puts the price tag around $1 billion. And a state commission sees this as about a $600 to $900 million proposition. Patty, I'll let you go first this time. What do you expect voters to do when confronted with such a wide range of cost estimates. Patty Healy: Well, I think that there's been a fair amount of misinformation put out. And this Health Policy Commission study, which I did read, also states that that includes a 4 to 6 percent raise for every nurse, and what it used as a figure for each nurse is $300,000 per nurse. It doesn't cost that much to hire a nurse. The figures are wildly inflated. And so consequently, we don't believe it. Angela Belmont: So the Health Policy Commission came out with that cost estimate, and it's related to detailed staffing data. You know, the $47 million that is projected is, from the other side, is that it doesn't use publicly-available staffing data, nor does it include the psych hospitals, ORs, or maternities, post-acute beds, pediatrics, or rehabs. And it also ignores the implementation of acuity tool. So I think that the Health Policy Commission is an independent study, [and] is likely to be the most conclusive cost to Massachusetts. Angela, several hospitals and health centers have gone on record as saying services would be impacted, including in some cases, a reduction of emergency room capacity or closure if this passes. What do you think? Angela Belmont: I think what this will do is limit access to care. I think that it will force closure of many community programs, and extend wait times in our emergency departments. It will also prohibit patient flow in the hospital, increase boarding times, and force our EMTs to hospital-shop to find a hospital that does have the ratios that they need. So I think that when people look at this ballot, they really need to understand the implications of what it's going to do to Massachusetts. Patty Healy: Yes. Well, in fact, in emergency rooms that are understaffed, they don't move patients through the system from the emergency room into the beds upstairs in the floors because they don't have the nurses to do it. [It] doesn't make sense to say that having more nurses means that it will be worse to move people around in the hospital. And once again, in California, they had a 47 percent decrease in waiting time three years after this bill passed in California. We have, in Massachusetts, we are 48th in wait times in the country. All we can do is better by hiring more nurses. Alright, I'd like to give you each about 30 seconds to give us a closing statement. Angela, since you lost a coin toss, we'll let you go first. Angela Belmont: Sure. I think in closing, I'd like to say that this ballot was supposed to be about improving patient care in California. It has not improved patient care. I don't believe that it will for Massachusetts. I believe that it will deny access to care. I think that we need to be thinking about our community services, and how EMTs are going to go to hospitals when patients can't get into the emergency department. So I don't see how this is going to reduce the wait times. I do think that voting "no" is in the best interest of Massachusetts. Patty Healy: Yes, I think the hospital industry in Massachusetts is a multibillion-dollar industry that actually has money stashed in the Cayman Islands, and they have enough money to take care of this problem. They have for 20 years, and the nurses who work for these hospitals have been sitting with executives for years trying to convince them to do so. Take a look at NEPR’s Massachusetts General Election Voter Guide 2018. In Massachusetts, campaigns on each side of ballot Question 1, which would mandate strict nurse-to-patient ratios in hospitals, have spent a total of $28 million. That's several times more than the other two ballot questions combined. Massachusetts voters will decide three questions on the November ballot, including one that asks whether anti-discrimination protections for transgender people should be kept in place.